International tourism to Puglia is growing stronger by the day, proving the value of the region’s outreach programs targeting foreign travelers. Pugliapromozione, the Region of Puglia government tourism agency, reports more than 1.17 million total tourist arrivals in Puglia for the first six months of 2014, representing a 1% increase over the same period last year, despite a falloff in domestic arrivals. La Gazzetta reported that foreign visitor arrivals for the six-month period were up by 17,000 from a year earlier, offsetting a decline of 8,000 by Italian tourists. 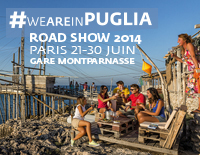 Much of this success can be attributed to Pugliapromozione, which has been staging Puglia tourism road shows and other events in major European cities this year. This entry was posted on Saturday, July 26th, 2014 at 8:30 am and is filed under Uncategorized. You can follow any responses to this entry through the RSS 2.0 feed. You can leave a response, or trackback from your own site.